Having grown up in the Western suburbs of Melbourne, I was very excited to spend an evening in Footscray to revel in “Ophelia Thinks Harder” by western suburbs performance group wit incorporated. “Ophelia Thinks Harder” is a play based on William Shakespeare’s great tragedy – Hamlet – with playwright Jean Betts adding a different frame to the story, and of course some modern twists. wit incoporated co founder Belinda Campbell directs the performance of “Ophelia Thinks Harder” and once you see the show I’m sure you’ll agree she does a stellar job. To set the scene: “Ophelia Thinks Harder” is housed inside the beautiful Bluestone arts space (a former church) in Footscray. Within, the setup matches that of a castle which matches the aesthetic of Hamlet. The stage and audience space was in a completely different setup to what I expected – with the stage being a massive ‘chessboard’ bookmark shaped space, along the sides / length of which sat the audience in tiered seats. It was thrilling to see how close the front row audience was going to be to the performers, but on that note all the reactions and facial expressions of the audience will be on show at times (so beware of you’re a frequent yawner or sniffer!) Each end of the ‘chessboard’ held a small, well decorated set – a castle room, and Ophelia’s bedroom. Heading up the amazing cast is Sarah Clarke as the titular Ophelia, Ruby Lauret as Maid, Leigh Scully as the dastardly Hamlet, Sam Anderson as the sweet Horatio and Jennifer Piper as the imposing Queen (among a fantastic array of other cast members). I could honestly write a separate essay on how awesome each cast member is in their own right, however for the sake of brevity I won’t do that here. Many of the cast members have more than one role over the course of the show and their hard work is seen through their reams of dialogue, strong facial expressions and physical scenes within the play. The actors listed above do a superb job of pulling the audience into their character’s world – when Ophelia’s lips tremble and her eyes search for help I honestly wished I could depart my seat and give her a big hug. When Hamlet stokes an angry fire inside each female audience member (and let me tell you – there were a lot of us!) I had to stop my urge to kick him when he was rolling around on the floor (not that I would actually do that, but the temptation was there). When the Queen made her grand entrance into the theatre, she was so striking and imposing – every set of eyes in the theatre was set on her. It was so quiet in the theatre you could have heard a pin drop. The strength of all the acting is testament to audience members feeling those emotions inside. The play contains turbulent scenes at times, but the cast take that in their stride – never wavering or looking tired – until the final moment when everyone takes a bow. A personal favourite character of mine was that of Maid (Ruby Lauret) – consistently helpful and dependable – with some funny and potent scenes too. The extended cast seems to be largely made up females, which in itself is a large departure from the times of Shakespeare which were traditionally male dominated performances – I found this refreshing. There are times during “Ophelia Thinks Harder” where there are female cast members playing males who then dress up as females, which adds to the complexity (but also adds some light hearted banter). “Ophelia Thinks Harder” takes elements of Hamlet, but the whole show is through the lens of Ophelia – especially her trials, self doubt, how she relates to others and her questions. This is where the feminist take also comes in, with Ophelia (and other characters) speculating on what it means to be a woman – the expectations of yourself and those that society thrusts upon you. Whether it be modern day society or otherwise, the expectations and messages sing the same tune. The dialogue is rich in many places, there are many notable quotes that I could list here but I don’t want to spoil the show. “Ophelia Thinks Harder” isn’t afraid to depict serious issues – sexual harassment, assault and partner violence among them – issues which have been brought to the forefront of society in recent times. All of the characters in “Ophelia Thinks Harder” are manipulative and have their own agendas, but this and the pertinent themes combine to make a show that you can’t tear yourself away from – you become compelled to watch to see how things pan out. There are times when this performance breaks the “4th wall” or comes close to it. The audience is so close to the performers and the cast utilise every square of space – an aspect that I loved. There were moments where (if I had outstretched my hand or leg) I could have touched many of the cast. During other moments, cast members locked eyes with audience members. All this made the show so real and potent. The audience couldn’t help but be drawn into the show and into each character’s spaces and predicaments. A wide assortment of props were used during the show, which enhanced the storyline (and laughs) in places. The audience seemed to be engaged and enthralled by this show with each scene and interaction between cast members. There were laughs, snorts of derision (especially reserved for Hamlet!) and gasps of surprise around every corner. Scanning around the room, I found many people smiling and enjoying every scene. Indeed, it is easy to sit back and enjoy this show – it is not pretentious and you don’t need to be a Shakespeare buff to enjoy the evening ahead of you. If you are familiar with Shakespeare, there are nods to some of his other works – Much Ado About Nothing and Macbeth among them – to make any Shakespeare fan smile. Understandably, Shakespearean shows aren’t everyone’s cup of tea but I encourage you to put your misgivings and prior experiences of Shakespearean plays aside. This is the play for you – there are modern twists and references, there are relatable characters and while there is an amount of traditional Shakespearean prose, traditional and modern dialogue and references are combined to create an enthralling, entertaining and worthwhile show. I had such a great night out and clearly became so immersed in the characters and storyline that when I exited the theatre I completely forgot where I was! We may have been in an inner Western suburb of Melbourne, but within the church we were in Ophelia’s domain. VERDICT: A fantastic production that will engage, enthrall and entertain. Shakespeare fan or not, it is easy to be pulled into Ophelia’s world and to be thrust into the storyline. It is a show you can’t take your eyes away from. “Ophelia Thinks Harder” will surely make you think harder too! 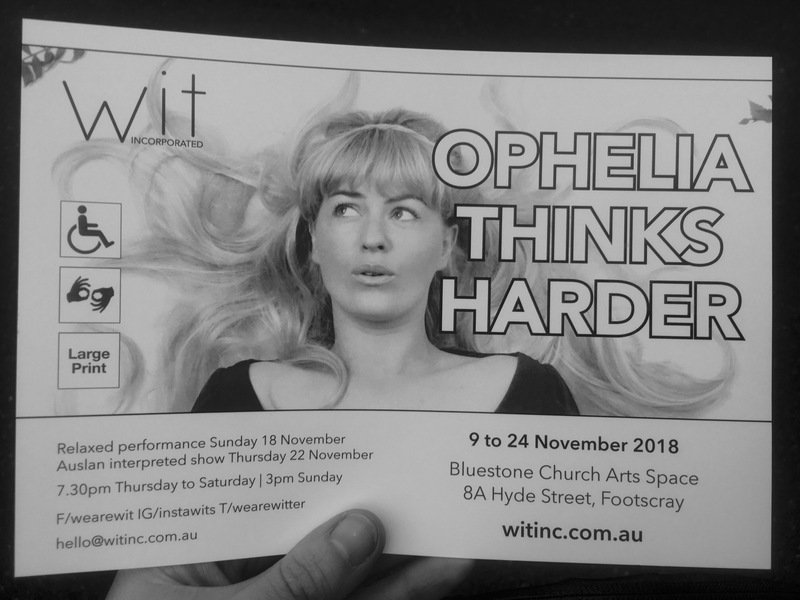 Tickets and information: “Ophelia Thinks Harder” is showing at the Bluestone Church Arts Space in Footscray until Sunday November 24th.